Ego’s job is to make things seem solid and safe, but ego’s sense is always delusional. When we see that whatever ground we hold onto in our delusional mind keeps us separate, then we can enter into this world of oneness. The world of oneness exists here now. It cannot be reached conceptually. How do I reach it without conceptualizing? By non-thinking. It’s not so easy to do, because to the degree that you deceive yourself by posturing, harboring ambition, or hiding your shadow side—by that much you hold yourself apart. Ego cannot keep things solid and safe, because all is empty and impermanent. That’s when transference takes place. Somebody or something has to be blamed for our perceived failures. Ego won’t take responsibility. So, when we stumble in the practice, we blame the teacher. But in actuality we do it to ourselves. Do you have the guts to step forward? That’s why the image of the Zen warrior is so fitting. No concept of winning and losing, simply facing the abyss. Where is the abyss? Right in front of you. If you don’t see that, you’re missing the importance of what we are doing. The abyss can swallow you up in a second. It is literally one breath away. How will you go? With fear and trembling? Or with a scream of affirmation? Jump into it, sword cutting, cutting, cutting! Joshu earnestly asked Nansen, “What is the Way?” Nansen answered, “Ordinary mind is the Way.” Joshu asked, “Should I direct myself toward it or not?” Nansen said, “If you try to turn toward it, you go against it.” Joshu asked, “If I do not try to turn toward it, how can I know that it’s the Way?” Nansen answered, “The Way does not belong to knowing or not knowing. Knowing is delusion. Not knowing is a blank consciousness. When you have really reached the true Way beyond all doubt you will find it as vast and boundless as outer space. How can it be talked about on a level of right and wrong?” At these words, Joshu was suddenly enlightened. I don’t need to tell you about Joshu and Nansen. I marvel that Joshu, the student, was with Nansen 40 years. That’s staggering to my mind. Joshu came to Nansen when he was about 18. When most scholars and Zen teachers expound on this encounter, they believe that Joshu was about 20 at the time of the koan, and still experiencing doubt. Harada Roshi believed Joshu was more mature, around 50. People can say a lot of things about this koan. On the surface, there’s a rather easy way to understand it. But there’s also an amazing subtlety here. You are looking at two spiritual geniuses! This is a wonderful exchange of student and teacher. We all know that Joshu wasn’t simply a dilettante. He may have had the second greatest enlightenment to the Buddha. And his teacher was no piker! This Nansen was something wonderful. How do we know? Because he produced Joshu! I remember sitting in a teisho by Aitken Roshi and he started talking about his teacher and began to cry. He said “Whatever I have amounted to today is because of my teacher.” I can say that too. Whatever people think of me is immaterial. I don’t know what this might mean for Maezumi Roshi, but whatever I am I owe to my teacher. On a personal level, I am absolutely, totally grateful, but I have one regret. I regret that I didn’t have 20 more years to practice with him. Amazing questioning goes on in this koan. Nansen says, “Ordinary mind is the Way.” Ordinary mind is not the conventional, self-centered mind, the mind of concepts and delusions. Quite simply, if you can’t see it, you can’t see it. And it’s in broad daylight! You may think you can make it up but you can’t; you’ll be easily tripped. That’s why the koans are so beautiful. You get a little insight and you think, “I’ve got it now!” Then you pick up the next koan and you stumble over it. It is beyond the realm of concepts, words and phrases. Nansen says when you have reached the true Way, beyond doubt, beyond yes and no, good and bad, you will find that it’s vast and boundless like space. Joshu asked, “If we don’t make an effort, how do we know that it’s the Way?” That’s a wonderful question. I like to think it came from a mature Joshu. If you don’t make an effort, how will you know? The Sixth Patriarch also responded to that question by saying that there is understanding but it simply can’t be expressed in words. It is beyond concepts, words and phrases. There is a quote from Dogen on how you accomplish this: “Be intimate with the activities of the ordinary mind.” What are the activities of the ordinary mind? Gardening. Cleaning house. Driving. Dealing with a spouse or partner. Caring for children. Working on a computer. That’s the functioning of ordinary mind. How you relate to that is the critical point. Dogen says “be intimate.” Be one. Very few people experience the reality of the world of oneness, which exists here now. The only thing that holds you from it is what holds all of us from it: the delusional mind. The delusional mind that sees this “I, me” as separate from it. To become intimate with this ordinary mind means to be one with it. We know that the first six levels of consciousness, what we call discriminating mind or the egocentric mind, doesn’t rigidly hold this self. You forget yourself all the time! Like when you are deeply engrossed in doing something and look up and see that time has disappeared. You lost yourself. The seventh consciousness, the conveyor consciousness, is where self is rigidly held. How do we penetrate it? How do we cut through it? You can’t do it as long as you stay in those first levels, those first realms of consciousness and formation of self. Because the effort you make is itself the separation. If you see the subtlety of this koan, you’ll see that your effort becomes your obstacle. You can be well-intentioned, dedicated and committed. But your effort itself is the problem—the “I” making an effort, the “I” trying to accomplish something. There is nothing to be accomplished! You are the Way. Understood intellectually, you’re in delusion, and it doesn’t transform you. Penetrate it intimately, and it will in fact transform you. It shifts your perception of reality, and it’s real. Should you use effort? Sure. But here again is a teaching by Dogen. He said simply, “Do what your teacher tells you.” Each one of you has a relationship to a teacher. Some have a deeper karmic connection. Some not. Some who sit in this room won’t practice here in a year or so. They’ll be running around again, going east of the river, west of the river. What you have to do, from the center where you sit, is look at the relationship, and do what the teacher says. What does the teacher say? I can tell all of you. The teacher says if you’re counting your breath, just count the breath. If you’re following the breath, just follow the breath. If you’re working on a koan, just be the koan. Thoroughly chew it up. Don’t care about answers. Don’t care about getting ahead. If you’re doing shikantaza, just sit. That doesn’t sound so threatening, does it? I’m telling you the secret of the dokusan room! Watch your mind buzz. See what it’s doing. Then set it down and be intimate with this moment. There are koans to this effect. If you are intimate with this moment, who speaks? Who listens? One calls, one answers. What is it that calls? What is it that answers? If I don’t make an effort, how can I do it? The truth is, we have to make an effort. And we continue with that effort until we realize the most difficult kind of effort: the effort of no effort. It means when I sit, I just sit, fully accepting how I am. The beauty of this koan is that it contains so many teachings. Once you penetrate into this questioning by Joshu, swallow it totally, and become intimate with this ordinary mind of Nansen’s, you are transformed. If we can do it right here, this Hazy Moon, this Koun-ji Temple, can function in the most amazing way. You will transcend the place of grasping or rejecting, good or bad, my position versus your position. You can simply accept where you are, as you are. You don’t have to be envious of those who appear to be in a higher position. If they appear to be higher, you have not penetrated this ordinary mind. Then you take care of it, realizing that each one of you is the center of the Hazy Moon. How it’s perceived, how it’s taken care of, will depend upon the depth of your intimacy with this. You might think that the people hanging around talking with Nyogen are the important ones. You might be surprised how boring that is. Or you might think that the people cleaning the toilets are not important. Actually, the people who clean the bathrooms are the most important people here! Because when people come in, that’s how they judge the center! In some sense, maybe they’re the most fortunate people in the practice. I remember one time Roshi said that you have to reach the point where when you take care of the toilet, it’s like taking care of the altar, and when you take care of the altar, it’s like taking care of the toilet. Then you’ve reached the realm of vast emptiness, no holiness. And you truly have moved into the sacred. Buddha said want little and be content with what you have. For some of you, your mind starts churning instantly. “Yes, but” you argue. No buts. Where you are, as you are, transform it into a field of gold. That’s what Buddha Dharma guarantees if you truly give rise to this ordinary mind. This ordinary mind is the Buddha’s realization. I and I alone, non-doing. Does non-doing mean I lay around with my thumb in my mouth? No, it means non-doing the chatter in my head! Let the river flow. Understanding is there, the Sixth Patriarch said, that can’t be expressed in words. As a matter of fact, that understanding will become clouded and confused if I try to grasp it intellectually. The discursive mind clouds over this ordinary mind, keeping us in chaos and confusion. Don’t set up a difference between practice and the Way. 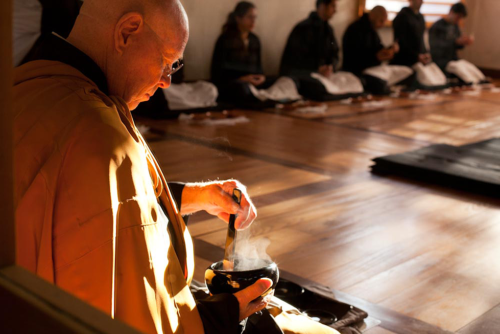 Dogen taught, “Practice is enlightenment.” If you really can do the practice, that’s enlightenment! This not knowing is silence. Yasutani Roshi said there were three kinds of silence, or not knowing. One is the very presentation of the Way. The second is a kind of half-hearted extemporizing: “I’ll shoot this out as an answer to see how the teacher responds.” The third form of silence is just total confusion and delusion. In a sense, in this not knowing, there’s nothing to be said. It’s obvious, isn’t it? It’s interesting. We can settle toward that. We hear it. We hear the great silence, the absolute. And then what happens? You want to organize it, embellish it. Ego says, “Let’s have a bigger rush!” You have to go through that barrier to see what kind of rush is there. You can’t do it conceptually. What is it? It’s not hidden. You can’t miss it! But few will accomplish it. Can you imagine what an amazing space we inhabit? The myriad things enrich it. To the degree I want to rely on the conventional self-serving mind, I won’t see it. No samadhi, mind banging around, running over here, running over there. It is not a question of getting something. It is the courage to give it all up. That’s what dana, or giving, is all about. You start by giving up material things because ego is greedy. Ego consumes. Ego is a hungry ghost. Hands and mouth full, saying “Don’t ask me to give anything up.” Dana is one of the perfections of a bodhisattva. How do you do it? True dana is giving away the self. That’s what we’re moving toward. Let me give you an admonishment: don’t let this time get past you. Don’t get caught in holding onto past craziness and delusion. We sit on the very peak of liberation. Dharma, the truth, has given this to us, because our practice has been pure. The moment your mind churns in the vain attempt to understand that, you throw yourself into the shadow world again. Great, good karma and diligent practice produces this. What are you going to do? Jump free! Jump free! Step from the top of a 100-foot pole! Let the spring breeze clear away the clouds of delusion. Bring up this great body of the Buddha. Totally free, move like a tiger in the mountains! There’s nothing more important. A talk given at the Hazy Moon Zen Center on Oct. 19, 1997.